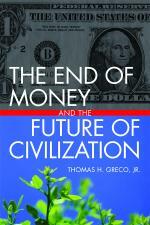 To mix things up, I thought it would be fun to share some knowledge gained from Thomas Greco’s The End of Money and the Future of Civilization across two blog posts. This first post will cover the challenges facing us (ch. 1-10). The second post will cover how we can navigate into the future (ch. 11-20). I apologize in advance for any misinterpretations of the material and look forward to corrections. I can think of no better executive summary than to quote Greco directly. The good news is that Congressman Ron Paul has brought attention to the issue of money creation. Greco includes an exchange between Ron Paul and Alan Greenspan at a February 11, 2004 House Financial Services Committee hearing in which Paul suggested that the power to create financial bubbles was an ominous power. (39) Greenspan’s response was interesting. Congressman, as I’ve said to you before, the problem you are eluding to is called the conversion of a commodity standard to fiat money. We have statutorily gone onto a fiat money standard and as a consequence of that it is inevitable that the authority, which is the producer of the money supply, will have inordinate power. Mercifully, Greco takes us up the steps of the “ladder of economic civilization” (H. Withers) to where we are currently overlooking what some observers are calling “the controlled demolition of the global financial system.” (58) At each step in the ladder, we can detect how the essence (or value basis) of money changed. To be clear, this historical investigation is limited to reciprocal exchange which excludes gifts, involuntary transfers (taxes, theft, etc) and counterfeiting. Symbolic money – Claim checks or receipts for deposited commodities like gold or wheat are symbolic money. What’s noteworthy about symbolic money is its acceptability “derives from the fact that it can be redeemed by the holder on demand for the amount of commodity that it represents.” (92) Greco spends relatively little space on symbolic money and calls it the half step between commodity money and credit money. Of course, as Greco points out, the redeemability of paper was abandoned and that’s not a bad thing. Let’s summarize. No money was created with barter trade, so we were not yet on the ladder. The creation of commodity money took place simply by harvesting the earth’s natural resources. Symbolic money was created when a deposit of commodities was made. What about credit money? Hmmm…. So, what is this “loan” business? What happens when the bank “loans” Joe $1000? It’s like the credit limit authorization just described, except that instead of Joe’s balance starting at zero after the authorization, Joe’s balance starts at $1000. Instead of payment declined at an account balance of -$1000, payment is declined at an account balance of $0. At the time of the loan, just like the credit authorization, no credit money is created. However, in the terms of a so-called loan, the bank requires that Joe give an IOU to the bank at the time of the loan instead of later when Joe makes one or more purchases. Joe receives nothing in exchange for the IOU at the time of the loan. So, ideally, by accepting the bank’s terms, Joe’s intention should be to use the amount of the “loan” immediately.1 Just because the bank is offering to set his account balance at $1000 instead of $0, Joe shouldn’t think the bank actually loaned him anything. The bank just authorized a credit limit and took his IOU ahead of time. Credit money is created when it is accepted in exchange for goods or services. Greco acknowledges grassroots initiatives that support the return of money creation from the banking system to the national government but warns against any elite power. The fundamental problem with the present political money system is the monopolization of credit (money) per se, and not who happens to be the owner of that monopoly…what we really need for government to do is not to take control of the money monopoly, but to end it. In the next post, we’ll continue with the second half of the book. This may happen automatically as Joe might immediately start earning token interest on the amount of the loan. But this just proves the point as the newly created credit money has bought a badly performing investment from the bank and if it stayed there, Joe wouldn’t be able to repay the loan. This is intended as a basis for discussion, and is a record of my current thinking on the matter. 1) The power to create credit is vested in each economic subject, be it a business or an individual. The use of credit thus created for the purpose of mediating economic exchange is subject to certain rules. 2) Credit is created as the counterpart of non interest-bearing debt. Debt is expressed as a minus balance on a personal account, while credit is the positive balance. Credit may be exchanged for some good or service considered of equal value, or it may be gifted to someone else to spend. One person's debt is another person's credit. The overall balance is always zero. 3) Definitions: Credit is monetized trust. The word credit is used to signify a positive account balance. Historically, credit has been the capacity of individuals or businesses to incur debt because of the trust others place in them. Finally, the term “Credit” (capitalized) signifies a unit of value, like in “the price for this is five Credits”.